A dog Shelter will keep your pet cooler in the day and warmer at night, plus keep him out of the wind and rain. A dog shelter can be a simple structure or a fancy dog house. Here are some plans and ideas for protecting your pet from the wind, sun, rain and cold. For more dog shelter options visit our Discount Dog House store. Merry Product's exclusive line of wood pet houses is characterized by their unique style and superb craftsmanship that complement both outdoor landscapes and indoor decor. They are made from kiln-dried and treated Asian fir. 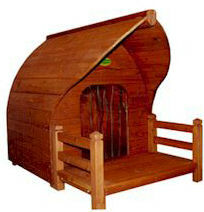 These pet houses are distinctive, sturdy, and durable. The natural tone stains are used to enhance the appearance and durability of your pet's house. The stable cellular structure of wood allows the pet house to withstand humidity and extreme temperatures. Give your dog somewhere to sleep comfortably with this simple, yet elegant, dog house. This cedar dog house will give your outdoor dog a cool place to rest during those hot summer days and a safe place for him to go at night. Made from Eastern white cedar this dog house is durable and won't rot in the rain or from mildew. This dog house will look great with any kind of backyard motif. 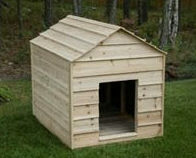 This dog house style is available for all sizes of dogs from toy to giant. From the sturdy craftsmanship, to the stylish touch of a chimney, this extra large outdoor pet house is perfect for medium and large sized dogs. The amply sized house comes with a spacious open-air front porch surrounded by beautiful latticework. This house is specially designed with a raised base to help keep dogs dry. It also features a window covered by sloping horizontal shades to allow for ventilation while keeping out the sun and the rain. The unique design allows you to remove the roof top and bottom panels for easy cleaning. A doggie vacation home was inspired by a mountain top ski chalet. The designers at Merry Products have out done themselves with this modern Chalet model. The smooth cedar roof slopes from the center to the sides of the house where it transforms seamlessly into the walls of the living area. The curved roof projects out to offer a cover for the front porch addition. Find these dog shelters and many more using the search term dog shelter.